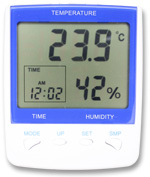 The Large Digital Hygro-Thermometer and Clock has a large LCD screen to display the both the temperature and humidity measured whilst also displaying the time. This Hygro-thermometer has an integrated alarm clock setting enabling you to set a time you need to regulate the temperature or humidity. You can set a Minimum and maximum limit, which gets stored in memory. To reset the minimum and maximum limits simply take out battery and set the minimum and maximum settings accordingly. PLEASE NOTE: Instructions included are unclear and may require some figuring out. Found setting clock easy. Have not tried to make it do anything more complicated. Good clear display. Whilst the thermometer display is large and clear (and from what I can tell so far, accurate), it has very limited functionality due to the poor quality of the buttons. I have been unable to change the time on the clock no matter how hard/soft I press the buttons, never mind set a max or min temperature. This is disappointing as otherwise the product would've scored a much higher rating. Good product and fair price.